Just2trade provides low commission trading fee of $2.50 per trade. It offers stock trading, option, exchange traded fund (ETF), mutual fund, etc. This article provides the review in details. How to spot a good brokerage? Just2trade is established in 2006. It is part of Success Trade Securities, an industry veteran with decade experience in brokerage. Success Trade Securities also provides other platform such as Lowtrades. Just2trade is targeting mostly experience traders or investors. 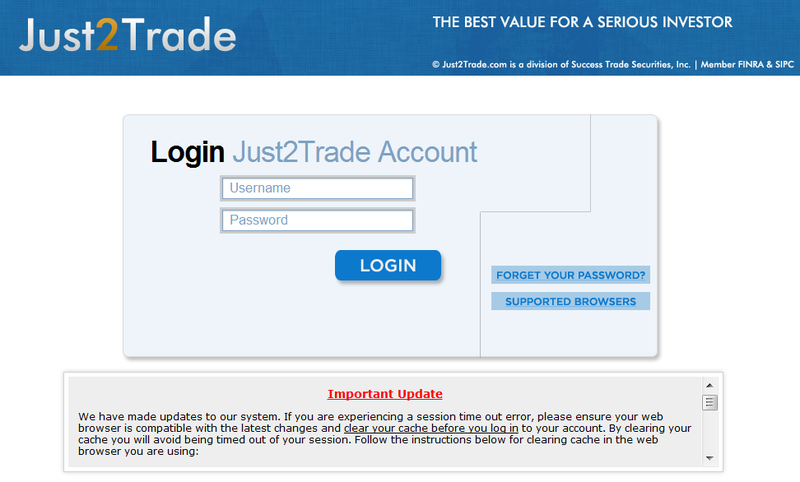 Just2trade requires 2 years trading experience to sign up with its service. It currently uses Legent Clearing LLC as their clearing. Legent Clearing, member of FINRA & SIPC, holds and clears all Just2Trade client assets. All Just2Trade accounts are insured under SIPC and supplemental Lloyd’s of London coverage provided by our clearing firm, Legent Clearing LLC. Just2trade offers product such as stocks, options, mutual funds. The minimum fund to open an account with Just2trade is $2500. There is no inactivity fee. For foreigner (non US citizen), you can open Just2trade account as well. Other Fees: Tender Fee: $25.00. ACAT Out: $50.00. Just2trade provides accounts to individuals, joint holders, retirement accounts, etc. Other accounts are IRA, Educational Savings Accounts and Employee Pensions accounts. Entities like Sole Proprietorships, Partnerships, Limited Liability Companies, Corporations and Trusts make up their clientele. How to open Just2trade account? Opening account is straight forward though it will be slightly slower than typical brokerage. You can either apply online or print out the form and fill them. Previous, I fill the form online and print out the form. Later, I mailed the form and submitted the copy thru fax/online as well. My account was opened within 1 week after I send my application. I have deal with various discount brokerages. I started investing with Fidelity on 2006, mainly buying mutual fund. I then tried Zecco due to their no commission fees. 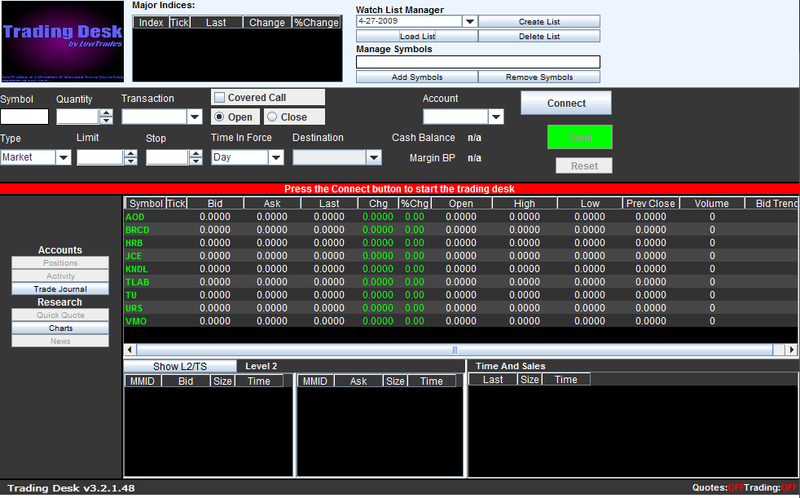 However due to limit of 10 free trades per month & $25,000 limits to get the free trades, I branched out to Just2trade. It has one of low commission. I started using Just2trade on 2009. In comparison with other brokerage, just2trade offers low commission for trading. It only cost $2.50 for trade. There is no limit for amount of shares. This means trading 1 share or 10 shares or 1000 shares will cost only $2.50/trade. Trading option will cost $2.50+$0.50/contract. So, 3 contract of options, you will pay $4.00 ($2.50+ 3 x $0.50). Margin rates are also competitive. The current margin rates are as follow (per July 30th, 2010). To open an account, you need to fund of $2,500. The trading platform is very simple and responsive. I can place either a Market order, Limit order, Stop Loss, Stop Limit, Market on Close, and Trailing Stop. I also can trade pre market and post market hours which can be very useful. Just2trade has 2 type of platforms (web-based & J2trader). I usually access them through web. Your computer also needs to support Java application hence the trading system is run thru Java. It also provides J2trader as trading platform. I also like its in-house trading tools like Maxit tax software that are available online. Maxit provides access to all tax related issues in trading. Other features like sales figures, stock alerts, market data and transaction details, options and mutual fund screeners are available in real-time. 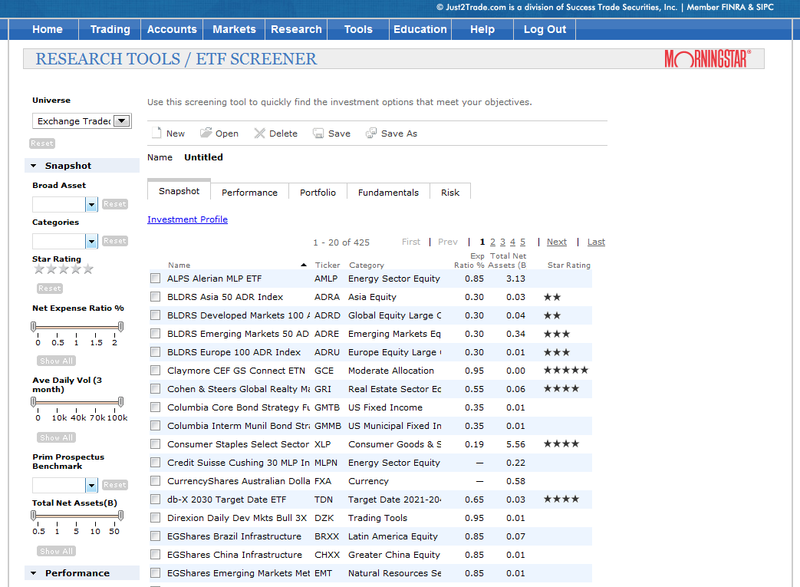 It also provides Zacks Screener to screen various stocks and mutual funds. I only use just2trade to trade stock & etf. I never use it to buy mutual fund, but I believe it should be very straight forward as well. I usually email the customer service if I have any issue. The customer service is very responsive. Other people have mentioned a non-responsive customer service, though I never have any issue. On 2007, there is an issue with their previous clearing house, North American Clearing. It has had their assets frozen by the SEC pending fraud investigation and this has resulted in inability to liquidate the customer asset. This happens for 2 weeks and has been resolved. Current clearing house is Legent Clearing. Incorrect cash balances and other account balance discrepancies. Just2trade is feature in SmartMoney and Kiplinger magazine as one of best brokerage with low fees & commissions. Disclaimer: I have no affiliation with Just2trade other than I use it for trading. Please do your own research for additional details. All information is as updated as June 3, 2012. Please trade responsibly.